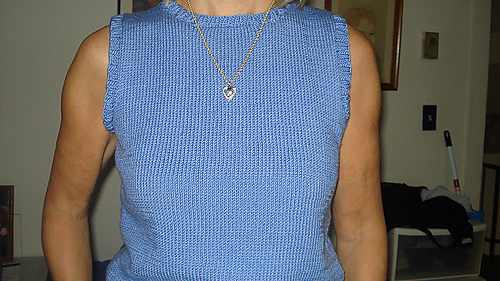 One day at The Yarn Company, Petra and Julie wanted to knit up a sample tank top – one that was quick and simple but at the same time unique. They found a beautiful multicoloured yarn they liked, but it was very thin and would not be a quick knit. Julie and Petra decided to try doubling this yarn with a solid yarn. It looked great, but something wasn’t quite perfect. After bouncing numerous ideas around, they finally decided to use two different solid colours separated by a stripe of the multicoloured yarn in the middle. This added just the right bit of uniqueness. Then, as Petra was knitting the tank top, she spaced out and forgot to finish the neck shaping. When she completed the first side of the neck, she looked at it and laughed at her mistake. But she liked the way it came out. The result was a square neck, and we loved it. Yarn is worked double throughout the sweater – this means you should hold 1 strand of A or B together with 1 strand of C as if they were 1. When piece measures 13” (14”, 15”, 16”) from cast-on edge, you will hold 3 strands of colour C together as if they were 1 and work in St st for 1”.